Workers preparing the ground for laying the foundation of a house in Chandeni - 3, in this recent picture. Where are these engineers hiding? We have searched them but never been able to get hold of any of them. We have no choice than to construct house with the help of local masons' knowledge. - Krishna Prasad Nepal of Chandeni - 5. KAVRE, March 13: Badri Prasad Parajuli of Chandeni - 3 received the first installment of the house grant five months ago. However, he was not able to initiate the construction work with confidence in lack of consultation from government technicians and engineers. However, with the monsoon approaching, he has started laying the foundation of his house with the help of local masons. “It is said that the government deployed engineers for our help, but I have never been able to meet one. If we start constructing house on our own, that might not work,” he wondered. “I waited a lot for professional engineer. Now I have no choice than to do it with the help of local masons,” he said. Parajuli doubts that the soil in his locality might be fragile. Since all the houses there collapsed during the earthquake unlike in other areas, he feels that the soil is not good for building houses. “This is only our guess. But I have started building house now, anyway,” he said. He is afraid that not showing to engineer even once while constructing the foundation of the house could make him regret later. “I wish I could show it to government engineer at least once so that there remains no chances of not getting the remaining installments. I have heard that government engineers won't approve the construction if they are not consulted. But I am not able to get in touch with one. We are in huge tension,” he lamented. His neighbor Som Prasad Parajuli is also going through the same dilemma. He is planning to start building his house from next week, but is not sure about design. “I could not get engineer's consultation. No engineer is available here. The only professionals we have are our local masons,” he said. “If we wait for engineer, we won't be able to start even by monsoon. And then nothing could be done,” he added. Som Prasad said that six families in his neighborhood are planning to build house as soon as possible in view of the approaching monsoon. However, all of them are not certain if they should build on their own. Many houses are being built in Chandeni area of the district currently. Approaching monsoon season has made them rush the construction. Amid confusion whether they are doing right or wrong, they are building house as per local masons' expertise. Few of these masons have received professional training on building earthquake resistant houses. “Four of us had received professional training on building earthquake resistant houses in Dhulikhel. I have been working here, while three are working elsewhere,” said Suman Majhi, a trained mason. Krishna Prasad Nepal of Chandeni - 5 stated that the government is only giving unnecessary hassle to the quake victims. When they searched and waited for engineers, the government never availed them. Now, the victims are in trouble because of the government's inability to avail engineers, he said. “Where are these engineers hiding? We have searched them but never been able to get hold of any of them. We have no choice than to construct house with the help of local masons' knowledge. And the government says that verification done by other than its engineers would not be valid?” Nepal questioned. Nepal further informed that the victims have been expediting construction of their houses so that they could complete it before monsoon. Some have even hired masons from the tarai districts, he said. This has affected employment opportunities for local masons. Tasbir Majhi of Chandeni - 2, stated that he became jobless as locals have relied on masons from tarai region. “They are giving all the works to those who have come from tarai districts. We have become jobless,” he lamented. He further added that villagers 'prefer those from Tarai though he's also a trained mason'. “They keep asking us if we can build better houses. I took professional training on building earthquake resistant houses and there are only few others like me. But locals still prefer masons from tarai region,” he added. Kedarnath Nepali, a social worker from Chandane VDC, stated that 157 houses are being built in the village. And only 57 of those are valid to get second installment. “This is our estimation. We don't have government engineers available for providing us accurate status of the houses,” he said. Government directives state that there should be 12 by 12 inches thick pillars. However, most of the houses are built with 9 by 12 inches thick pillars. 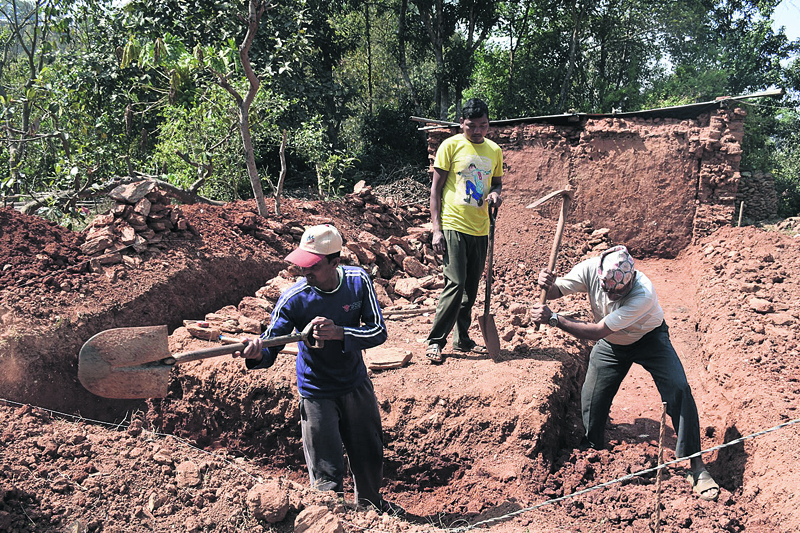 “So, going by government standard, many houses fail to meet the standards,” said Nepali. Apart from that there are several other directives that should be complied with for building earthquake resistant house. In total, 178 technicians were deployed by the government for assisting in constructing earthquake resistant houses. However, in lack of strict monitoring, those staffs and engineers did not go to or stay longer in the deployed areas for providing consultation, Nepali said.